Ahhhhhhhhh it was nice to have a few weeks off from the blogging world, I won’t lie though, I had withdrawals from cooking, from writing, from my #SundaySupper family and well just withdrawals from being in my kitchen really! I didn’t really make much for the holiday given our plans. We have dinner at my MIL’s on Christmas Eve, a small breakfast Christmas morning, I made a new quiche casserole that literally took me 10 min to prepare (that doesn’t even count) and Christmas evening I was in charge of a cheese platter, so really I did no cooking. It was nice to have the break, my whole family was sick, it just worked. However………….I’m back! My #SundaySupper family has already rang in the New Year with Reflections and Resolutions, go check it out, what a real cute theme, I just didn’t have it in me to make a dish 🙁 Today we are slow cooking our way into the New Year. So, Happy New Year everyone! I couldn’t say no to this theme because well the Crock Pot is one of my favorite kitchen tools to use! It saves me on most Tuesdays and Thursdays when the kids and I are out and about on play dates or hunkering in for a snow storm. I use it plenty while entertaining with a nice Chili or Soup warming in the background. Let’s thank Cindy from Cindy’s Recipes and Writings for hosting this awesome event! I can never have enough Slow Cooker recipes so I’m real excited for this day! The recipe I chose is a Beef recipe I made for my husband one night because, well Beef is his favorite, It’s adapted from a recipe in a Cooking Light magazine which made me feel a bit better and it was his birthday, so it was a win win for both of us. I’m not sure what the title of the recipe really means, it’s may be French, all I do know is that it was the best Beef recipe I’ve ever had in a Crock Pot! I added mushrooms because as I was putting the recipe together in my head, it just seemed like the right thing to do! I served it over egg noddles along side some Asparagus. It was a Sunday dinner I made for my husbands birthday and served it to my sister and my mom as well. Which they all raved was fantastic, here is the kicker………since the timing called for it to be cooked on high for 5 hours, about 2 hours into it I added a chicken breast right on top (my sister doesn’t like beef and I wanted her to be able to eat with us) it was awesome she said, it cooked in all of the veggies and juices and stayed nice and moist. Now I know some people are saying beef and chicken, well luckily my sister doesn’t mind if the chicken has touched beef, she just doesn’t the taste of beef so I was able to make everyone happy with this dish! This is such a warm and hearty dish for any winter meal! Heat a small dutch oven over low heat. Add oil to pan, swirling to coat, cook for 5 min. Add garlic, cook another 5 min. Remove garlic with a slotted spoon and put aside. Increase heat to high and add beef, sprinkle with 1/2 tsp of salt and pepper. Brown beef on all sides, cook for 5 min. Remove beef and place into a slowcooker. Add wine to pan, bring to a boil, scraping pan to loosen brown bits. Add garlic, beef, remaining 3/4 tsp of salt, remaining 1/4 tsp of pepper, carrots, and next 8 ingredients (through bay leaf); bring to a boil. Dump the contents of the dutch oven into the slowcooker. Cook on HIGH for 5 hours. Serve over egg noodles. 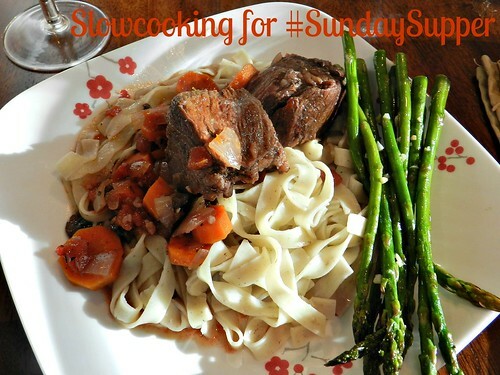 Let’s see what else the #SundaySupper family has “Slowly” cooked up today!! Your recipe looks delicious…it would be popular with my hubby too! I took a bit of a respite over the holidays too. It’s amazing how reinvigorated you are in the New Year! Yum! love the recipe and I love that you served it with pasta! What a great meal! I know my Husband would go crazy for this one!!! 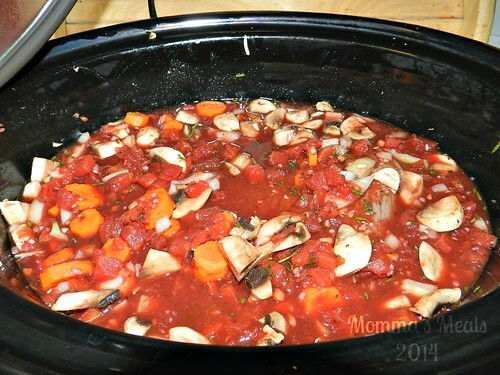 Great slow-cooker meal, Tammi! I like the choice of freeing up my time! I just love a beef dish that is served over egg noodles! This recipe sounds delicious!!! 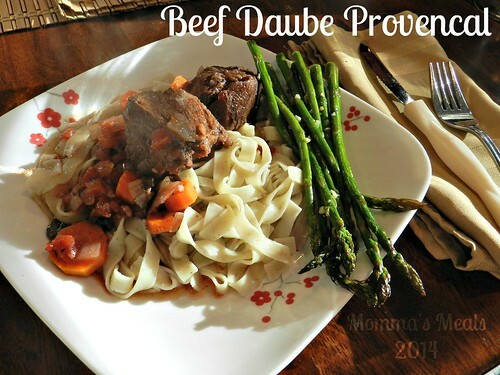 I love, love beef daube (thanks to Dorie Greenspan). Yours looks amazing served over noodles! YUM! There are some of my favorite things in that dish! Sounds yummy! Nice that you had a break, but we’re glad to have you back! Thanks for sharing & HUGS! Welcome back to the blogging world! A break is good every once in a while, but when the kitchen is yelling and screaming for you to come back, it’s hard to stay away! It’s true Shaina! It was yelling and screaming my name alright, the hustle and bustle of the holidays doesn’t leave me much time in there, now we are dealing with sicknesses! I’ll get back eventually! Thanks for visiting! Mushrooms are always the right thing to do! This looks outrageously tender and juicy! This is a gorgeous dish! It *is* nice to take a break from cooking once in a while. That’s kind of how my Christmas usually is, too. A holiday where others are cooking all sorts of great stuff, we are always traveling to others’ houses for dinner, and I don’t have to cook much. But, I did kind of miss it and am also happy to be back in the kitchen! I would be so happy with this meal, any day of the week. I even have some egg noodles floating around here somewhere. I think it’s a sign! It’s just too crazy to actually cook and enjoy it HAHA!! You won’t be disappointed by this one!! We love egg noddles! This is such a hearty and warm dish, and it looks delicious! Welcome back to the blogging world! This looks amazing and would definitely be a favorite for my husband too! Are there any men out there that don’t like beef? I have to confess though it’s one of my favorites too.. right behind veggies! I think I’ve actually made this cooking light recipe. Love the addition of mushroom! I’ll take that dish for MY birthday! I adore anything cooked with wine and tons of veggies. I also really like that you served it over noodles, yummy!! So many good things in this beef dish. Red wine, veggies, herbs, and more. Yummy!